Once voted the “Cleanest Town in Latin America” Grecia is a jewel of the Central Valley of Costa Rica. Far enough away from the hustle and bustle of Costa Rica’s largest cities, Grecia is a quiet hamlet. The center of town, both literally and figuratively, is the beautiful Catholic Church, Iglesia de la Nuestra Señora de las Mercedes. Made entirely of prefabricated steel, it is known as one of the most unique churches in the country. Adjacent to the church is a large central park where residents and visitors talk, relax, gaze at the many exotic birds that fly by, or just people watch. In the center of the park is a band shell that hosts frequent performances. Everything from the town’s youth orchestra to rock bands have performed here. Grecia is a farming town, mostly coffee and sugarcane, but also some produce and citrus. The people are friendly and welcoming and love to celebrate during holidays. The downtown is bustling with activity as the residents shop, do business, and drive through town on their way to another city. 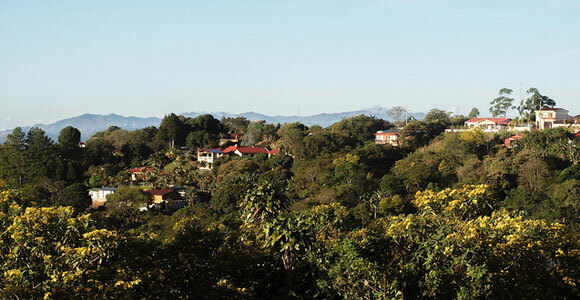 Most inhabitants, expats and ticos (as the Costa Ricans call themselves) live outside of downtown. There are multiple communities a short drive from the town center that provide easy access to the conveniences of town, but without the traffic. There are also five inclining mountain ridges that run for about 10 miles out of town. These ridges provide the coolest temperatures and best views. Grecia is the perfect place to retire. The town is a medium sized farming town of about 18,000 residents. It sits on the slope of Poás Volcano in Costa Rica’s Central Valley, meaning it is surrounded by mountains. Elevations for Grecia and its environs range from 3,000 to 5,500 feet, providing ideal temperatures year round and stunning vistas from most places in the town. In addition to the weather, Grecia is large enough to have nearly all the conveniences you might need. There are plenty of options for shopping in town. Multiple grocery stores provide everyday staples, and there are clothing stores, hardware stores, and even a mall. For healthcare there are multiple pharmacies, each with a nurse on staff. The town has many general practitioners to choose from, as well as some specialists. There are at least three dentists and a couple of optometrists too. Many of the doctors are U.S. trained and speak English. Grecia also has its own hospital and Caja office (Costa Rica’s national medical program). Another great thing about retiring to Grecia is the town’s proximity to other conveniences. 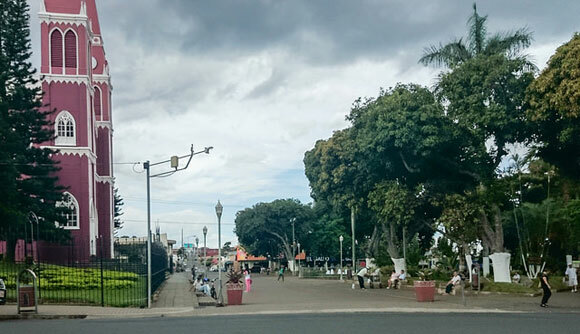 The international airport in Alajuela (along with other excellent shopping options) is only 40 minutes away. And the capital city, San José, which provides cultural activities as well as excellent restaurants, is only an hour away. Grecia provides a great lifestyle for those exiting the rat race of the U.S. and looking for a slower pace of life. Grecia’s perfect temperature encourages outdoor pursuits like walking or hiking, bird watching, and photography. The expat community in Grecia is large and active. There are many clubs and activities that allow for socializing and there are also many volunteer opportunities for those that wish to give back to the community. The town has multiple restaurants, some even feature live music provided by local expat bands. And then there is the feria, or farmers’ market. One of the best in the Central Valley, Grecia’s feria is a great place to meet up with friends and find great deals on produce. Real estate in Grecia is still affordable. Basic homes are available for around $100,000. A typical two- or three-bedroom, two-bathroom home will cost between $150,000 and $250,000. There are also many high-end homes over $500,000 and a few over $1 million, if that is what you are looking for. A typical rental range for a home that has two-bedrooms with one or two bathrooms is $700 to $1,000 a month. Since Grecia is a farming town and consumable goods are priced for residents, not tourists, prices for daily living are some of the lowest in the country. Produce is much cheaper than in the U.S. and meats are about the same. Each weekend farmers set up there stalls at the feria and shoppers can get deals like three pineapples for $2 or a huge bunch of bananas for $1. Grecia has a mall with retail stores and a movie theater showing new releases. A pair of movie tickets will cost about $12. The mall also has a North American style food court with a McDonalds, KFC, and Taco Bell restaurant, among others. A combo meal will cost between $7 to $9. For a sit down meal you can hardly beat the prices at a soda (a small family owned restaurant). The price for a casado, a typical Costa Rican meal of meat, rice, and beans, along with a beer will cost about $8. A meal at a larger restaurant will be more in line with prices in the U.S. For example, a meal for two with a glass of wine can run $40 or more. Household help is affordable in Grecia as well. Cleaning staff or gardeners for your property will run $3 to $4 an hour. 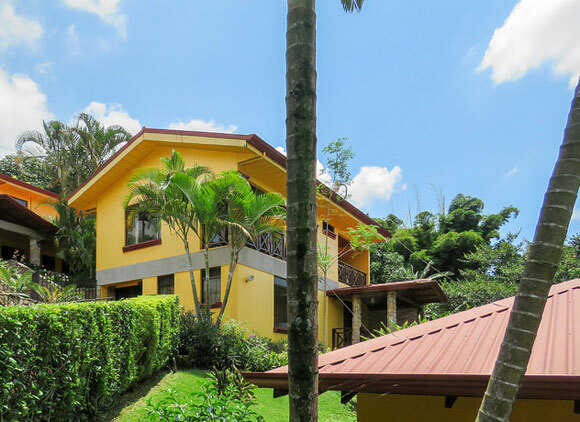 Grecia is a popular town in Costa Rica for expats, and for good reason. The town is large enough to have enough variety in shopping to meet almost every need, but it is small enough to be comfortable. When you go shopping or to eat out at a restaurant, you’ll likely run into a friend. In addition to its size and level of convenience, Grecia has what many consider to be the perfect weather—with daily temperature ranges from 60 F to 80 F, most homes do not have a heater or air-conditioner; they are just not needed—and wonderful views of the Central Valley. There’s so many places to eat and get a coffee in Grecia, too. For breakfast, my wife, Jen, and I love going to Soda la Perla, a hole-in-the-wall restaurant with room for only about 10 guests. We love the way they serve their coffee con leche, filtered through an espresso machine. It is a great place to practice your Spanish and eat where the locals eat, too. For lunch, we love Mas Q Sabor as much for the friendly owner, Jonny, as the tasty Mexican food. Upon entering downtown Grecia, visitors will see the famous red metal church and the adjacent idyllic central park. There are multiple urban legends about how the church mistakenly ended up in Grecia, but they are just that, legends. The church was purposely commissioned and built in the late 1800s and is the centerpiece of the community. In addition to the church, visitors will see a bustling town with traffic and noise and may wonder why so many people want to live in Grecia. The reason is that most residents don’t live downtown. And while there are communities near downtown, most expats chose to live on one of five roads that follow ridges up the slope of Poas Volcano. These ridges are three to nine miles outside of town and are at a much higher elevation. Grecia Centro sits at an elevation of 3,000 feet while the mountain ridges range from 4,000 to over 5,000 feet. 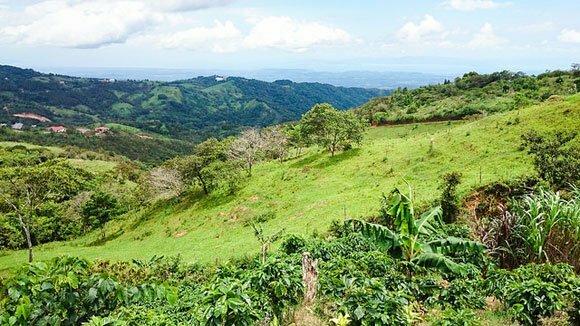 The higher elevation provides breathtaking mountain vistas, and smaller, less busy, coffee farming communities. The five ridges are: San Luis, El Cajon, San Miguel, Carbonal, and San Isidro. Each ridge radiates from Grecia like fingers from an outstretched hand. Because the ridge roads are often many miles long, there are typically multiple communities (church, soccer field, convenience stores) on each ridge. For instance, El Cajon is about five miles long and includes the communities of Los Angeles, El Cajon, and El Cajon Arriba. The ridges provide many different property types and prices. One I came across, located at 4,800 feet, is a beautiful home on the manicured grounds of a half-acre lot. The yard is planted with tropical flowers and fruiting trees including, mango, lemon, and banana. The house has two-bedrooms, two-bathrooms, and an office. The master suite has a door leading to the patio. The large kitchen is made for a chef and includes all stainless steel appliances. Just a 15-minute drive from Grecia, this home is listed for $279,000. For just $137,000, in the hills above Grecia, a cozy wood paneled home sitting on one-third of an acre of land is available. I really love this one. Not only is the price right but the house has a warm feel to it, like a log cabin in the mountains. Have your coffee on a patio overlooking the breadth of the Central Valley—from San Jose to Sarchi. Enjoy the crisp cool mountain air while smiling at the deal you got on your home. The home has two very large bedrooms and one bathroom. All of this just 20 minutes from town. High up on the El Cajon ridge sits a newly constructed home for the budget-minded. With three bedrooms and one bathroom, this small house has 900 square feet and a small yard. The home and yard might be small but the views are big—looking toward San José, Turialba Volcano, and the airport. The home sits just steps away from a bus stop and the bus to Cajon runs every hour, on the hour. All this for just $73,000. Rentals are also available in Grecia and a two-bedroom, two-bathroom home would typically run from $700 to $1,200 depending on amenities. Many of the rental properties come fully furnished. You can find rental properties available close to town available for long-term. I found one for $750 with two bedrooms and two bathrooms in a fully furnished home. The home is already set up for cable and WiFi. Grecia is a great small town to live in. The people are friendly, the weather is nice, and the size is right. Make sure that if you check out the town, that you also look at the hills surrounding the town. You’ll be glad you did.